This study applies the concept of the psychological contract to the relationship between management practices and volunteers. Formalization of the voluntary sector is impacting on volunteers’ experiences and may breach the psychological contract from the volunteers’ perspective. This mixed method study interviewed 67 volunteers and volunteer coordinators/administrators, and collected mail survey information from 152 volunteer organizations. The transactional management practices of keeping formal records and not paying volunteers out of pocket expenses are negatively associated with volunteer recruitment and retention. Alternatively, publicly recognizing volunteers through a volunteer newsletter supports volunteers’ relational expectations and is positively linked to adequate volunteer numbers. 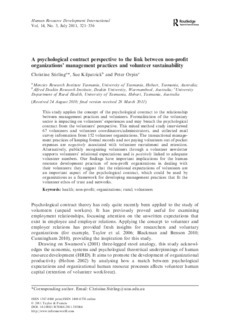 Our findings have important implications for the human resource development practices of non-profit organizations in dealing with their volunteers: they suggest that the relational expectations of volunteers are an important aspect of the psychological contract, which could be used by organizations as a framework for developing management practices that fit the volunteer ethos of trust and networks.